Have You Walked A Mile In Your Students’ Shoes? 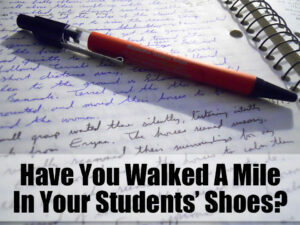 You are here: Home / Pedagogy / Have You Walked A Mile In Your Students’ Shoes? Humor me on this one. Get out a piece of notebook paper and — Don’t start yet! Wait until I give you all the instructions — write a letter telling me why you wanted to become a teacher. Give yourself 10 minutes to complete this task. I bet you’re already thinking about what you want to say. You may even be thinking about what you’ve already written on this topic. It should be easy to write? Whoa there! Don’t start yet. Write this letter with your non-dominant hand. That’s right. If you’re right-handed, write with your left hand. If you’re left-handed, write with your right hand. If you’re ambidextrous — put the pen in your mouth and write. Yes, you read that correctly. Get you’re pens ready… As you’re completing this task, pay attention to how you’re feeling. Go ahead and get started now. I’ll be here when you get back. And don’t read ahead! Here’s the method behind my madness: This past weekend, I attended an Oklahoma Writer’s Project workshop at Bryant Elementary School in Moore. One of the presenters, National Board Certified Teacher and OWP Teacher Consultant, Renae Waugh, M.Ed., asked us to write about driving. Think of who taught you how to learn to drive, and write about your first experiences behind the wheel. She gave us about 10 minutes or so to complete this task. My pen flew as the memories spilled out of my head and onto the paper. I covered the entire page (minus the prompt area). Easy peasy! Ms. Waugh covered a few more topics, and then we went back to that learning to drive topic. This time, she asked us to write a letter about our driving experience to someone in the room, but with our non-dominant hands. Remember, I already had one draft of my story sitting right in front of me. It should be easy to just convert it to letter format and fold the paper and stuff it into the envelopes she provided. But that was not my experience. While I am not completely ambidextrous, I tend to be at least decent at using my left hand. One of the other teachers even noted that my handwriting was legible. But I was only able to write about two sentences of my story. I had everything I wanted to say in my head — but I couldn’t get it out of my pen because I was having to take so much time forming the letters. Instead of focusing on what I wanted to say, I had to focus on the actual writing of each individual letter. As I experienced the frustration of not being able to say what I wanted to say, and the bit of panic that went with realizing time was almost up and I had barely begun my story, I realized that this may be how some of our students, those who aren’t as dexterous as the rest, feel. Except I know that I am a good writer, that I am smart and capable. I am an adult and I am able to recognize the situation for what it is. But what if I were just a kid who had struggled all my school years with writing or reading? What if I thought that I was dumb because I couldn’t complete my assignments on time, instead of realizing that it would just take me longer than others? What if I knew that I was going to struggle with the assignment, that I wouldn’t be able to finish it, so I just decided to quit caring and not even bother starting? What can we do to help these students, to show them that they are valuable, and capable, even if it takes them longer? Offer those students who are struggling with fine motor skills (or other disabilities that may slow them down) additional time to complete assignments. Allow those students to complete assignments in a way that is easier for them (verbally, in some cases). Even with those modifications/accommodations in place via an Individualized Education Plan (IEP), students experiencing this difficulty may still believe that they are less intelligent than others, even if they are clearly brilliant when answering verbally. Students are very aware when they are struggling to complete assignments that everyone else is zooming through.